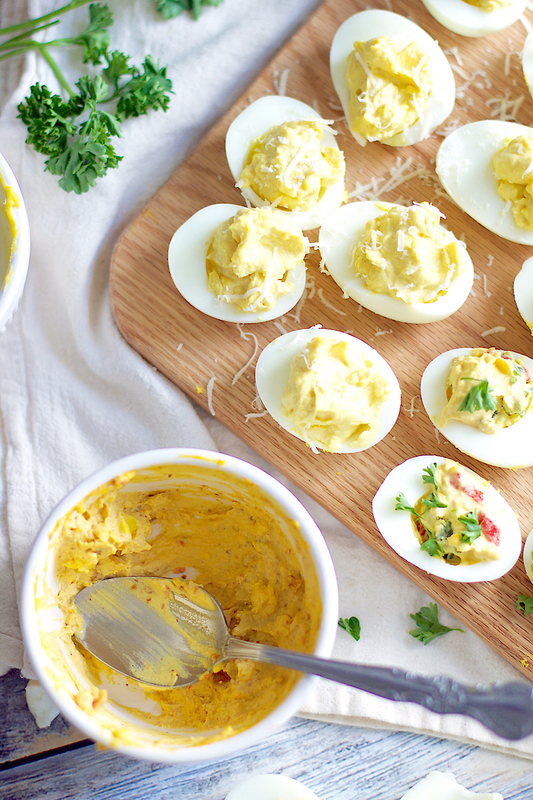 Who has a bazillion hard-boiled eggs left in their fridge?? Or maybe the more appropriate question would be, who doesn't have a bazillion hard-boiled eggs left?? Mr. RC and I love to keep them on hand for snacking or adding to salads, but over the Easter weekend, I found that some-bunny had made more than the usual 3 or 4 eggs. When the problem is too many hard-boiled eggs, the answer is always to devil them. So devil them I did. 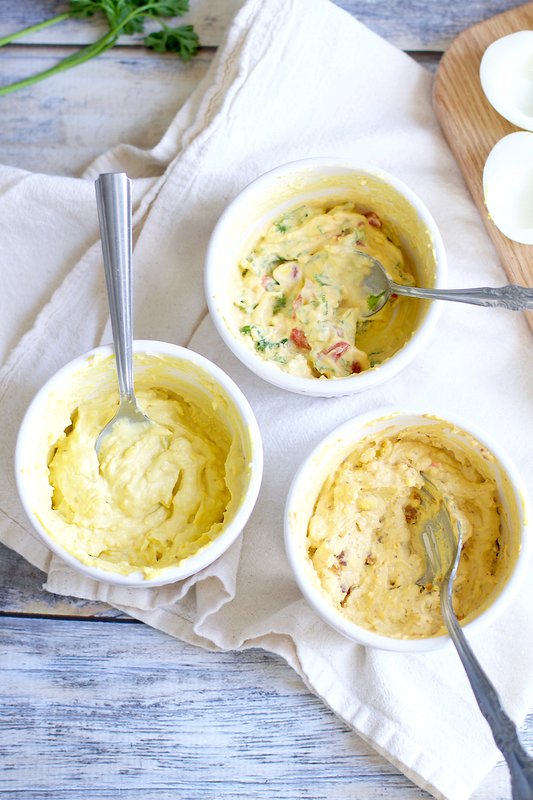 And because I knew I wouldn't be the only one with a few extra eggs hanging around come Monday, I came up with 3 ways to fancy up the flavor of the traditional deviled egg. Because how the devil (ed egg) else could you possibly consume nearly 2 dozen hard-boiled eggs?? In a small bowl, mash the egg yolks with a fork. Add in the mayonnaise, yogurt, and mustard, and, with a spoon, stir everything together until well-combined, fluffy, and smooth. Lastly, mix in the pepper and parsley. Spoon filling into each half and serve immediately. 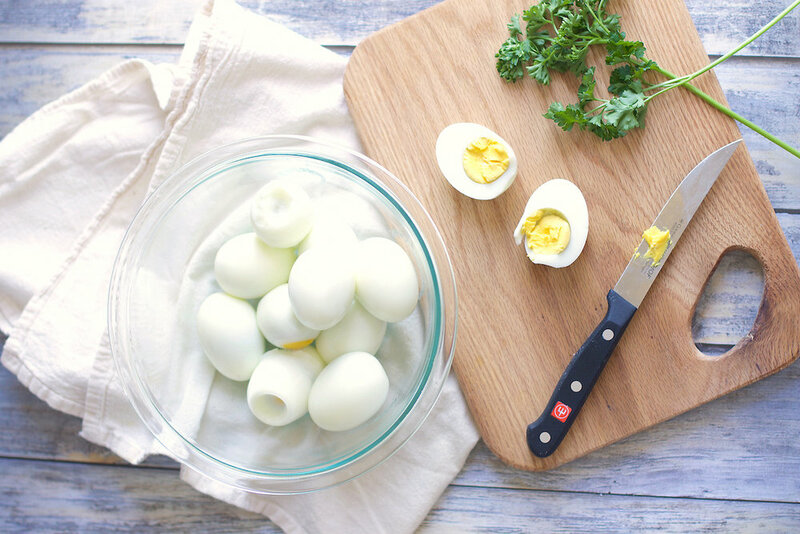 In a small bowl, mash the egg yolks with a fork. Add in the remaining ingredients and, with a spoon, stir everything together until well-combined, fluffy, and smooth. Spoon filling into each half and serve immediately. 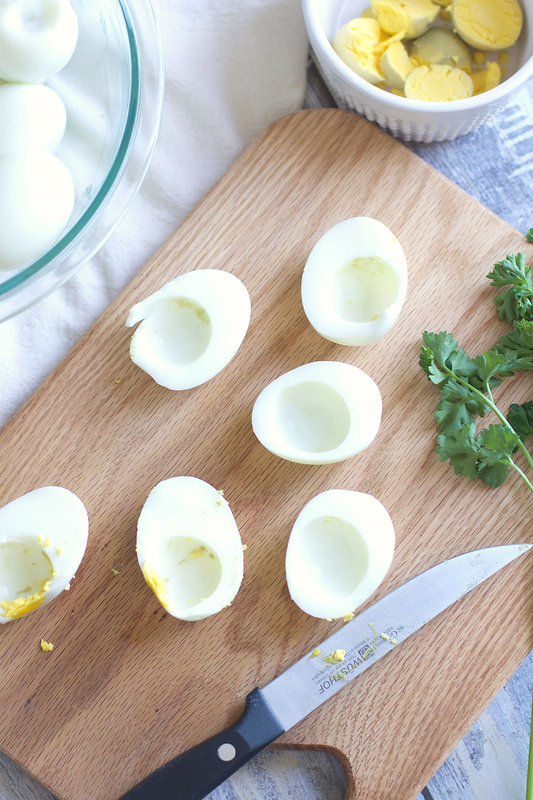 In a small bowl, mash the egg yolks with a fork. Add in the remaining ingredients and, with a spoon, stir everything together until well-combined, fluffy, and smooth. Spoon filling into each half and serve immediately, sprinkling more bacon crumbles on top, if desired. If you don't have chipotle mustard, you can use 1/2 a teaspoon of chipotle paste (adding more or less depending on taste preference) along with 1/2 teaspoon of mustard (adding more or less depending on taste preference).